Steven Simenson, a 1977 (BPharm) graduate of the College of Pharmacy and CEO and managing partner of Goodrich Pharmacy, Inc., has been selected by the University’s Board of Regents to receive the Outstanding Achievement Award. The award is the U’s highest non-degree honor. University President Dr. Eric Kaler will present the award to Simenson on June 28. Simenson was recognized for his innovation in pharmacy practice, and his leadership in his community and pharmacy in both Minnesota and nationally. Simenson joined Goodrich pharmacy of Anoka in 1981. Under his leadership, the practice has grown to six locations and the services offered have expanded from traditional dispensing services to include immunizations, asthma management, blood-pressure monitoring, cholesterol screening, custom compounding (human and veterinary), diabetes management, medication therapy management, smoking cessation, as well as health services to employers. 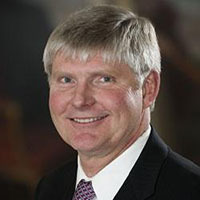 Simenson was instrumental in Goodrich Pharmacy becoming one of the first pharmacy practices to be connected to a health system’s patient electronic medical record. This connectivity is now a national model for improving patient care by facilitating interdisciplinary practice. He is a renowned pharmacy leader who has served as president of the Minnesota Pharmacists Association in 2000, and of the American Pharmacists Association (APhA) in 2014. He has been recognized for his leadership with a number of awards, including fellowship status in APhA, the Bowl of Hygiea Award, and the Distinguished Pharmacist Award from the Pharmacy Alumni Society. He also serves on the college’s National Board of Advisors, and as a mentor and preceptor to pharmacy students and residents.